Every Saturday you can sit down with your morning coffee and read my newsletter before you’ve got to the bottom of your mug. Here are the key reasons to subscribe. My newsletter arrives every Saturday morning, around 10am. That means you get a chance to read it when you are less interrupted by emails, phone calls and so on. 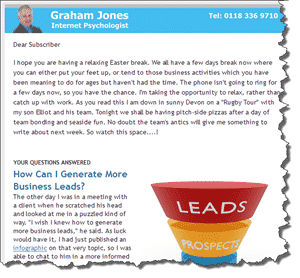 It means you can digest my newsletter more easily than something which might come mid-week when you are more busy. Each week the newsletter answers a topical question about online business and provides you with practical guidance as to what you can do. There will be links to practical resources which will help you as well as my advice on what steps you need to take to solve the issue of the week for your business. Although I recommend a book or some other product, I don’t use my newsletter to sell you my services. The product I recommend each week is something which I use in my own business and which I value. If I recommend a book it is because I have read it myself. Each week I look back at my business week and pick out something I have learned and used to improve my own business. I share my personal learning with you, so you can learn from my mistakes. You get to know me, my thoughts, my ideas, my inspiration and experiences. I share with you my business growth and activity and provide you with the tips and thoughts I have discovered along the way. 6. The newsletter is FREE…! There is no payment – it is yours with my compliments. Each newsletter is saved as a web page and you get access to the complete archive so you can check up on things you recall from past newsletters. So, if you want to boost your online business you need my weekly newsletter…! Sign up right now…! My newsletter comes out every Saturday morning. Make sure you get your copy! Highly recommended. My Saturday always starts well with your excellent newsletter and my cup of real coffee. Thanks Charlotte, glad you enjoy it.